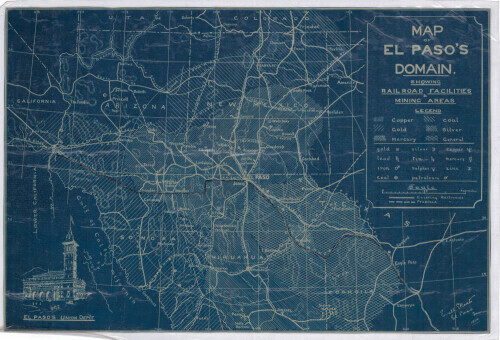 This map represents the Fort Bliss Quadrangle in El Paso County, Texas. Topographical features and El Paso landmark buildings are shown. 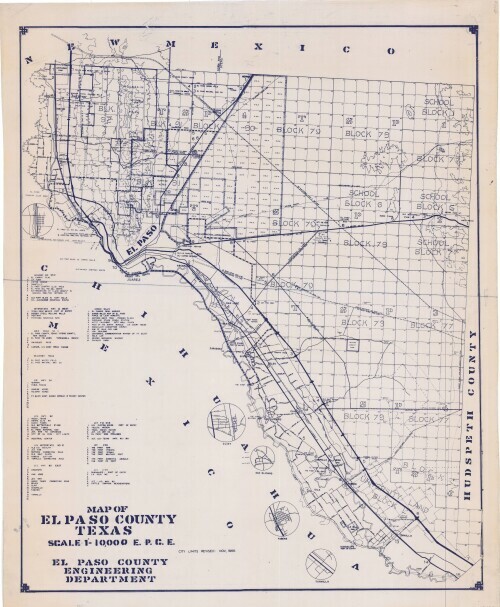 Produced by the county engineering department, this map of El Paso County,Texas includes block numbers, chief roads, pipelines, and an index of landmark locations. 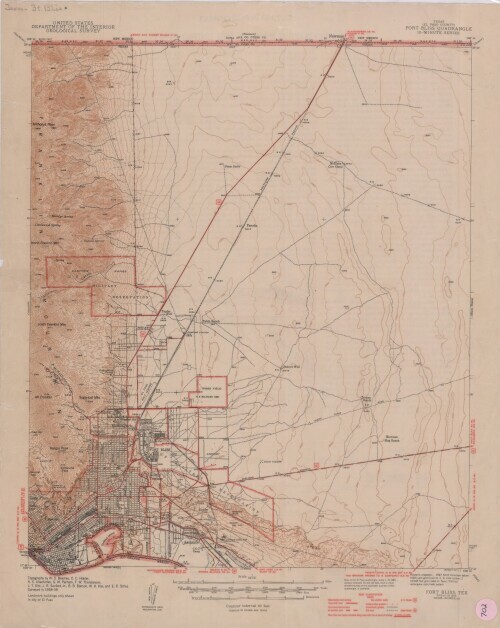 This map of El Paso, Texas includes topographical features, but focuses on chief roads, interstates, and highways; the location of Fort Bliss Military Reservation and Cordova Island. The Franklin Mountains and individual mountain names, municipal and utility landmarks, schools, churches and parks are indicated. 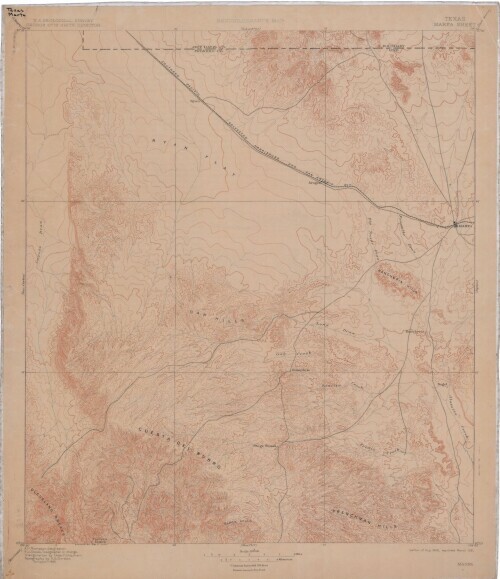 A topographical map of the North Franklin Mountain delineates Fort Bliss Military Reservation, underground gas pipeline roads, chief interstate roadways, and railroad lines. 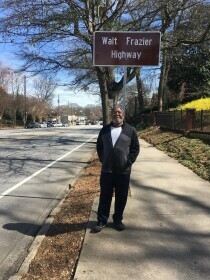 A Road data legend is included. 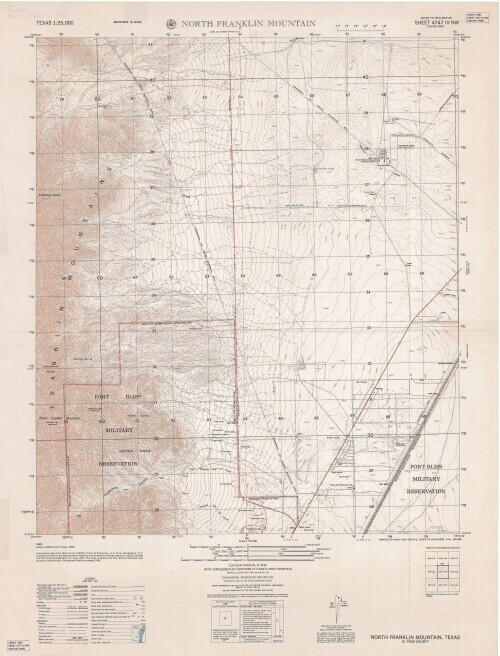 A geological map of a portion of West Texas based on U.S.G.S. 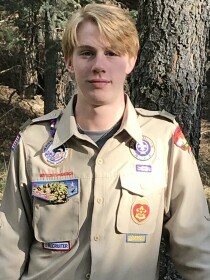 topographic sheets and reconnaissance maps. 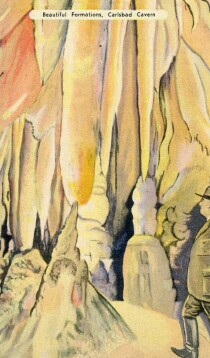 Cretaceous details are noted on a color illustrated background. The legend includes quicksilver, coal, silver and lead; intrusives, lavas and tuffs; granite and syenite; and diorite. 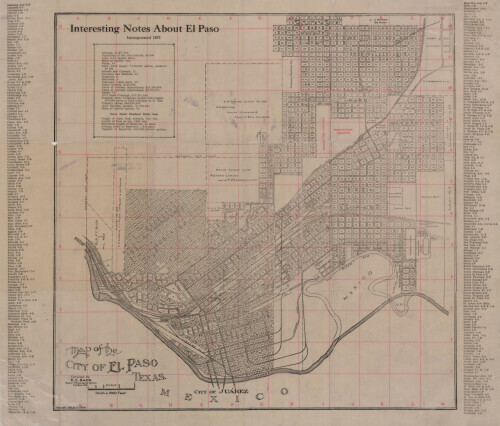 Map of the City of El Paso, Texas with addition names and interesting notes regarding altitude, population, area, water supply, property values and building permits . Also includes details about Elephant Butte Dam. 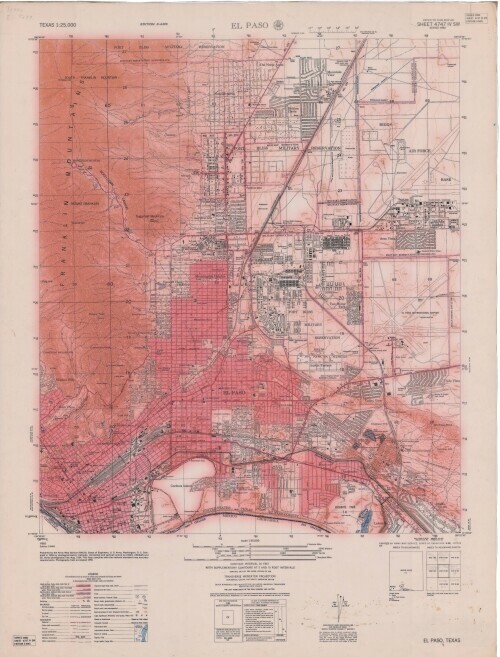 Topography of El Paso County, Texas and the El Paso Quadrangle. Indicates Fort Bliss, El Paso, and communities along the Rio Grande border - Alfalfa, San Jose, Ysleta, Socorro, San Elizario, and Clint. 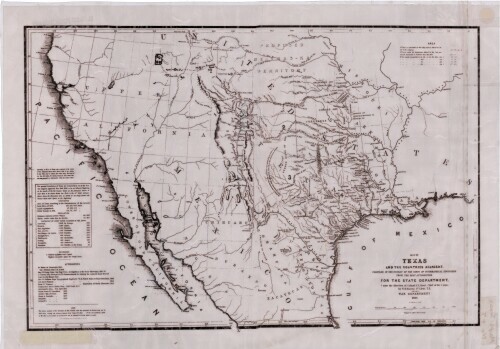 Map of the dividing line between Mexico and the United States representing the initial point according to the treaty of December 30, 1853. 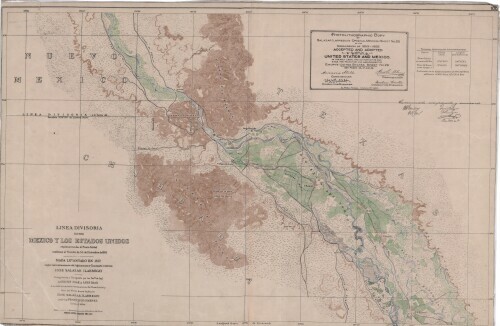 Color topographical representations of mountains, sierras and rivers are shown. Railroad facilities; mining areas of copper, gold, mercury, coal, silver, and general. 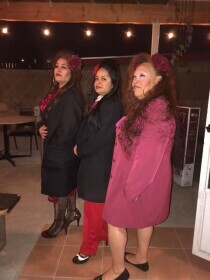 Credit:: AAA El Paso Automobile Assn. 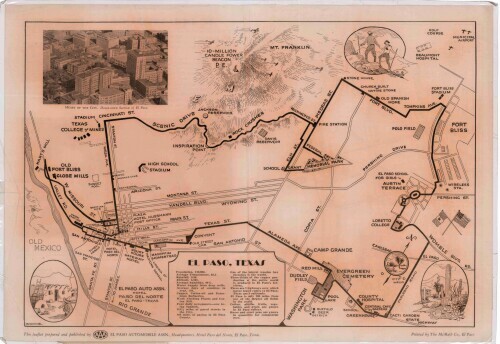 Visitor guide with pictorial map of El Paso, Texas and international cross streets into Juarez, Mexico. Location of places of interest in Juarez, Mexico are noted. Reverse side shows main avenues, streets, historical landmarks, train station, parks, military fort, municipal buildings and colleges. Also notes population statistics; infra-structural, weather and agricultural details. 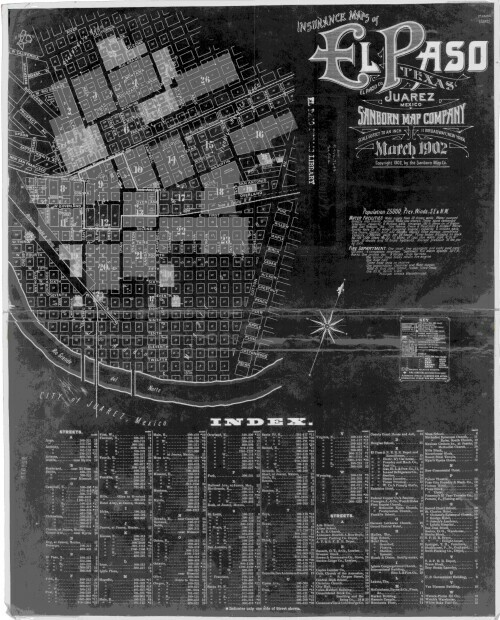 Sectional street map with index and key to indicate building structure types; Scale 50 feet to an inch; Population, water and fire department statistics. Reverse side shows leaflet cover "for the exclusive use of J.W. Magoffin, Agent". This map illustrates natural gas pipelines extending from California, Arizona, New Mexico, Texas, and Louisiana. The legend lists pipeline names and compressor stations. An inset of Los Angeles is included. 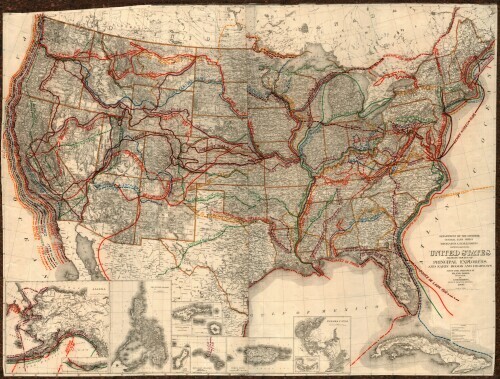 This United States map colorfully illustrates routes taken by principal explorers with their respective dates. Early roads and highways are also shown over a background of topographical features, state and city names. Insets for Alaska, the Philippine Islands, Guam, the Hawaiian Islands, the Samoan Islands, Porto Rico, and the Panama Canal are included. 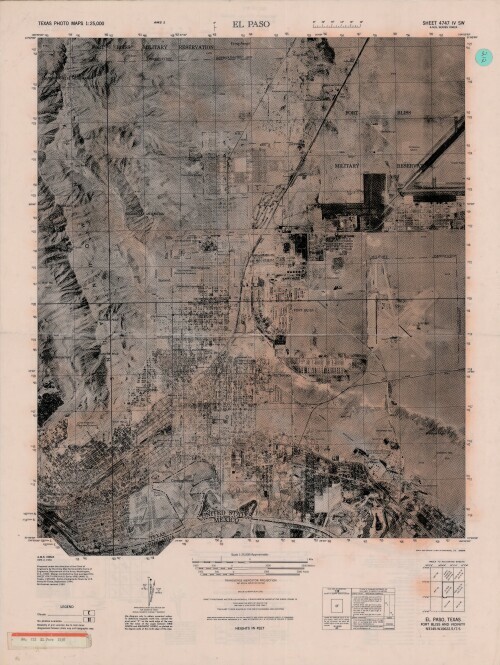 This topographic USGS map sheet indicates Marfa's surrounding areas of Ryan Flats, Oak Hills, Cuesta Del Burro, Cleveland Breaks, Frenchman Hills, and Rancherita Hills; also creeks, railway lines, and county boundary lines. Map of Texas and its adjacent countries includes statistics for land and chief towns; and population statistics for free whites and slaves. Includes topographical representations for mountains and rivers and indicates cities and Indian tribes. 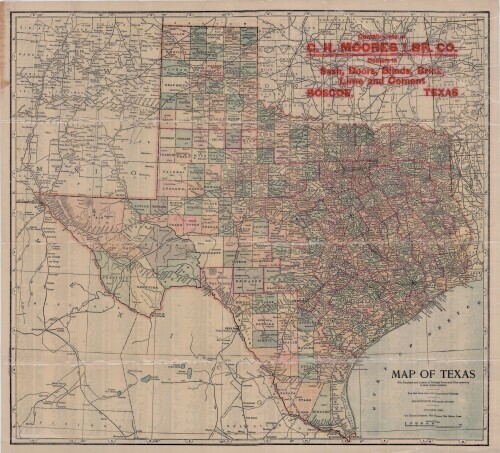 This map of Texas includes colored divisions of counties with principal cities and towns. Congressional districts are outlined. 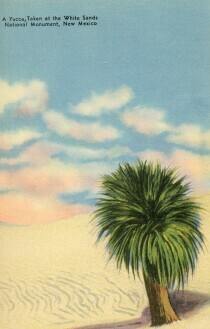 Bordering states, cities, country and gulf information is shown. Reverse side contains population statistics for all principal cities and towns shown on pictorial map. 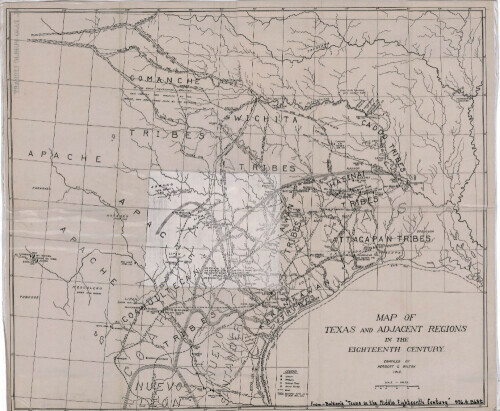 Map of Texas and the adjacent regions illustrating missions, presidios, Spanish towns, Indian villages, rivers, roads and boundary lines. Indian tribe names are shown in their areas of concentration. 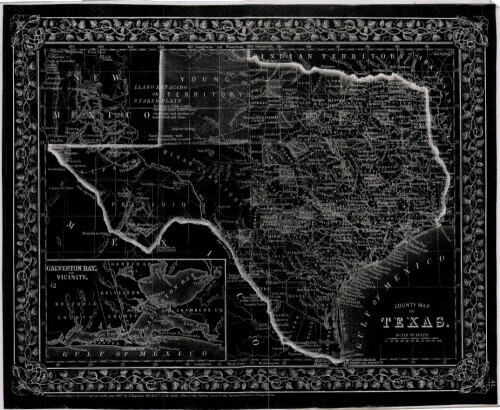 This is a county map of Texas represented in black, white and dark gray shades. This map includes an inset of Galveston Bay and the vicinity. Bordering states of New Mexico, Arkansas, and Louisiana and the country of Mexico are indicated. Topographical features-rivers, rios, mountains and bays are shown; and slight shading differences define neighboring counties. Chief cities and towns are indicated. 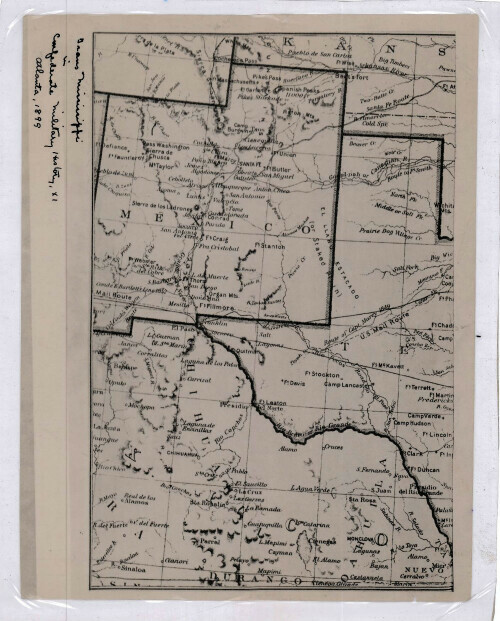 Map of the borders between New Mexico, Texas and Chihuahua, Mexico. 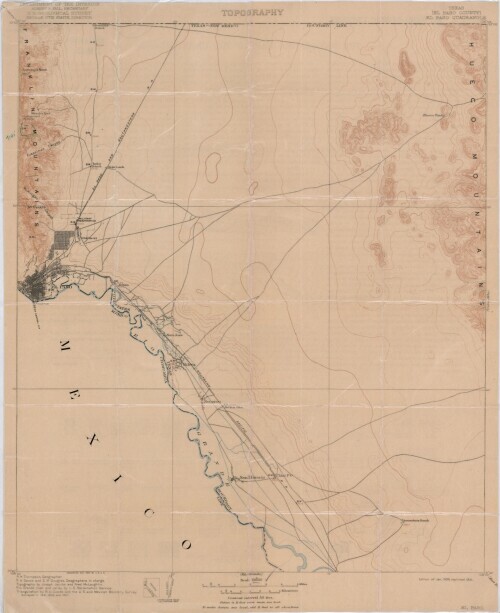 Names of cities, towns, forts and rivers are shown; Mail route line is indicated.